Filling of an income tax return is always a difficult task for the taxpayer, the income tax department implement some changes in the form to simplify the process for the taxpayer, this article makes you understand major changes under ITR1. You will get a detailed comparison of the new ITR1 and old ITR1. One of the major change implemented by the income tax department is the pattern of discloser of income details in ITR1. If you look closely at the old form you will get only 3 heads to disclose the information of income. On the other hand, the new form is introduced with a lot of disclosers required by the IT department, it could be problematic for some of the taxpayers, how use to trick income tax department and try to save tax. But for the other honest taxpayers, the changes in the form is like blessing which makes them free from any inquiry due to unfortunate mistakes. New Form introduce bifurcation of salary details in the difference columns which provide the clear picture to the department for calculation of tax. In column 1(i) Salary (excluding all allowance, perquisites, and profit in lieu of salary) the amount punch in the column required details under section 17(2) of the Income Tax Act. You are required to deduct all kind of allowance and perquisites and enter in the column. Some of the allowance paid by the employer is not exempted by the income tax department the column 1(ii) required that figure to enter. Value of perquisites like free accommodation, sweat equity shares allotted etc need to enter in column 1(iii). Any payment received or due in addition to your salary or wages from your employer is treated as profit in lieu of salary. The income tax department required information in separate column 1(iv). After deduction of all heads discussed above deduction u/s 16 (entertainment allowance and professional tax) should be entered in column 1(v). After adding all the above particulars and subtracting amount u/s 16, you will get a figure of income chargeable under the head “salary”. Both the segments are different considering the income of the taxpayer. If we opt for self-occupied, you only have to punch the interest paid on borrowed money in column 2(v) rest of the column are restricted. The interest paid on money borrowed is subject to maximum ₹ 2,00,000, and this amount is further deducted from the income from salary 1(vi). If you opt for Let out, you have to fill the column 2(i) with the amount of rent/letable value received. In column 2(ii) the amount of tax paid to the local authority required to punch. The system automatically provides you 30% of Annual value which was deducted from the above income from rent/letable value along with tax paid to the local authority in column 2(ii). “The interest paid on money borrowed is subject to maximum ₹ 2,00,000, and this amount is further deducted from the income from salary 1(vi)” – same as above for self-occupied segment. Finally, we get Income chargeable under the head “house property”. Column 1(vi) and 2(vi) provide the final figure which is taxable before deduction u/s 80. From the assessment year 2018-2019 the new column in introduced late filling fee u/s 234F which is amounting ₹ 1000, ₹ 5000 and ₹10000 as the case may be. This column is introduced to withdrawn the power of tax officer for imposing of late filing penalty up to FY 2016-17, but from this financial year, if you as taxpayer according to norms are late to file an income tax return it is mandatory to fill the column. As per section 234F of the Income Tax Act, the penalty of late filling from 1st August to 31st of December in the penalty of ₹ 5000 is levied if the due date is 31st of July. If the due date is 31st of July and the return is filled after the 31st of December a penalty of ₹ 10000 drag out of your pocket. If the total income does not exceed ₹ 500000 (five lakh), the penalty payable under this section shall not exceed one thousand rupees. Everybody in India remembers that period of demonetization and the period of time spent in line for depositing of cash in your bank account. Income tax department introduce a field (Part E Other information) in FY 2017-2018 for disclosure of cash deposit in the period of 09/11/2016 to 30/12/2016 the department require to get closer to the people holding cash in hand in the form of old currency. I suggest my clients look into your bank account statement before entering any figure in the form. This Field is totally erased from FY 2018-2019 in ITR1. Under this section, the individual or HUF are required to deduct TDS @ 5% if they made the payment of rent for ₹ 50,000 or above. The amount of deduction required to mention in the field which is added by the income tax department. 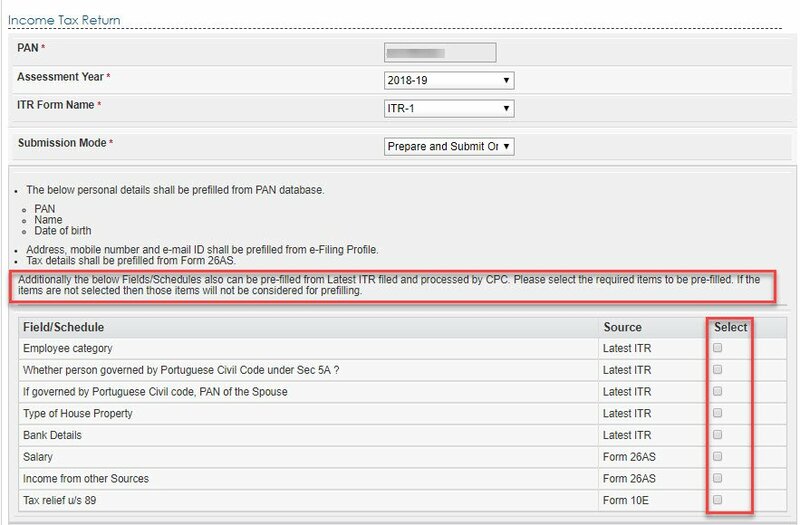 Finally, on the last portion of your ITR1 form, a new field is introduced which required disclosing: ‘if your return has been prepared by the tax return preparer (TRP). Identification number of TRP and name of TRP is required. As we all aware that some of the details in the form are prefilled and fetch from PAN data. Income tax department introduces a new field and schedule selection option for the taxpayer, which allow them to fetch additional information from previous/latest ITR along with FORM 26AS and Form 10E. The above option is automatically fetched from the latest ITR just by selecting the Box on the right side of the option. If governed by Pthe ortuguese civil code, PAN of the Spouse. The details of Salary and Income from other sources which were available in Form 26AS will be fetched by selection in that column. If you want to get tax relief u/s 89, it is mandatory to fill Form 10E, don’t worry just select the option the details u/s 89 will fetch automatically. This new introduction from income tax department reduces the time frame by half because this above information takes more than half of your Efilling time. The changes made by the income tax department bring awareness among people to fill the return and it is very important to understand major changes under ITR1 in the proper way and play part in the growth of the country.